Our Monroe Gunmetal Barstool is stunning. Matching the industrial looking bistro chair it also has a smooth gunmetal finish. 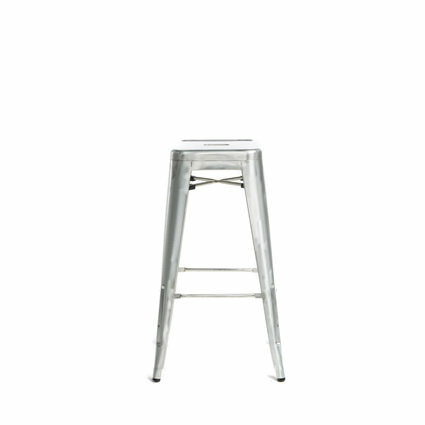 This barstool is also available with a back. Availability & Pricing: All rentals are on a first come first serve basis. When quoting our current inventory availability it is for that specific time and may change as new orders come in. We cannot guarantee an order unless a deposit is placed. We do offer a discounted rate for multi-day rentals. All prices are subject to change. For more information you can email actents@aol.com or call the office at 609-383-1970. Feel free to call us at 609-383-1970 for any questions on our party rental items in the South Jersey area including: Egg Harbor Township, Mays Landing, Margate, Northfield, Pleasantville, Ventnor, Stone Harbor, Avalon, Wildwood, Sea Isle City, Egg Harbor City, Brigantine, Atlantic City, Ocean City, Cape May, Longport, Absecon, Galloway, Long Beach Island, Hammonton, Buena, Vineland, and Egg Harbor City.